A mourner grieves for her relative, missing and presumed dead, last summer at the scene of the garment-factory collapse on the outskirts of Dhaka, Bangladesh. Thursday will mark the first anniversary of the garment-factory collapse in Bangladesh, which killed more than 1,100 people. Dozens of North American clothing retailers came forward with promises and donations after the catastrophe in Rana Plaza exposed the terrible conditions of the employees — who were told to work despite evidence of structural damage to the building. One year later, where are Americans getting their clothes? And how much do we know about conditions in the countries that make those clothes? The United States exported $5.8 billion worth of apparel in the 12 months leading to February 2014, according to the Department of Commerce’s Office of Textiles and Apparel. That may sound like a lot, but it pales in comparison to the $80 billion in clothing the country imported during that time. China — by far the biggest source of textiles in America — accounted for 37 cents of every dollar’s worth of clothes imported to the United States. 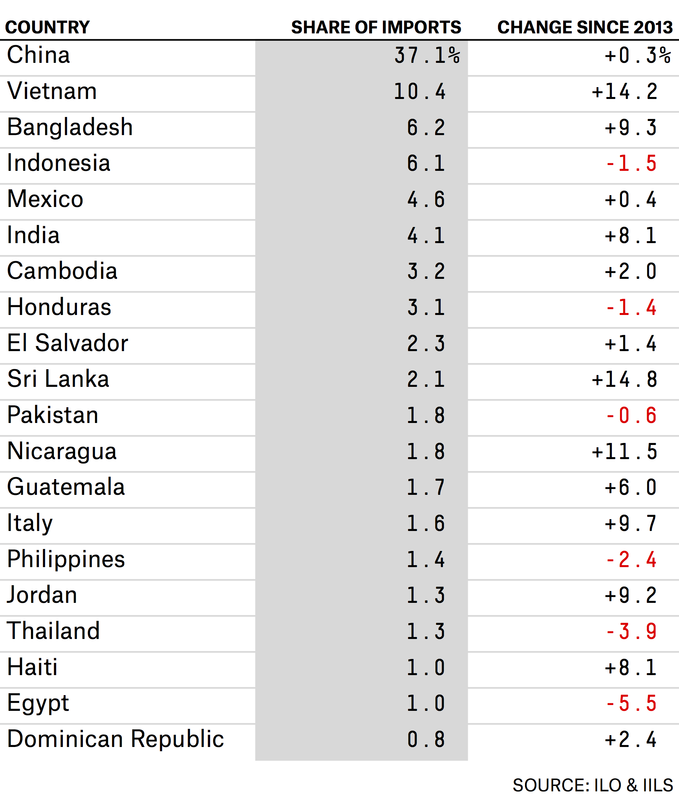 In the year ending February 2013, Bangladesh accounted for 5.8 percent of all U.S. clothing imports. In the following year (ending February 2014, 10 months after the factory collapse), Bangladeshi products ticked up to 6.2 percent of clothing imports. There isn’t good data on the working conditions of the employees supplying the clothes the United States imports. Factory auditing is often ineffective: Supply chains are difficult to track, and factories can hide unsafe conditions and coach employees on what to say. What’s more, data takes time to collect and verify, so it’s hard to measure what has changed since the disaster in Bangladesh. The most basic information is just starting to be collected. Last year, though, the International Labour Organization (ILO) and the International Institute for Labour Studies published a report on employment conditions in Bangladesh. The figures demonstrate why clothing is so important to the country’s economy and why workers in that industry are particularly vulnerable. Europe is the destination for 51 percent of Bangladeshi exports of ready-made garments; 29 percent travel to America. Ready-made garments represented 77 percent of all exports from Bangladesh in 2011, and exports as a whole made up almost a quarter of the country’s gross domestic product. 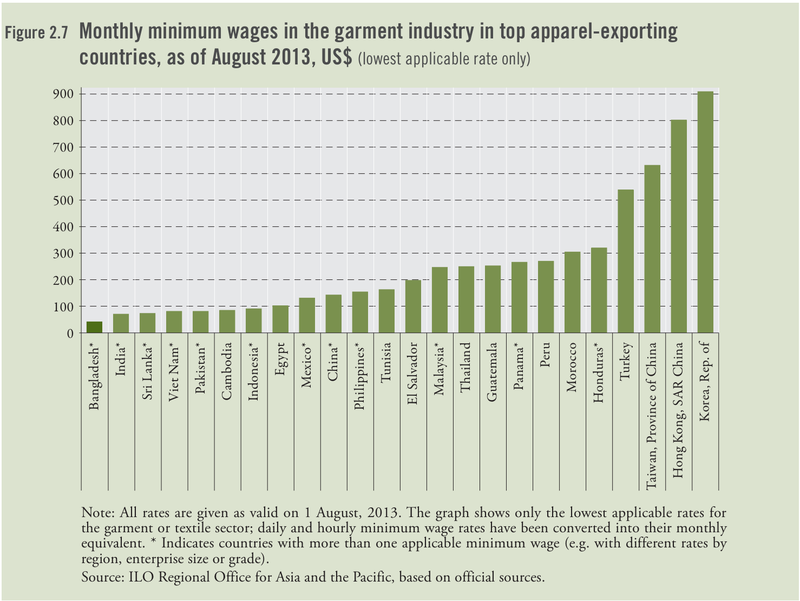 Of the top apparel-exporting countries, monthly minimum wages in Bangladesh were the lowest — $39 dollars per month as of mid-2013. 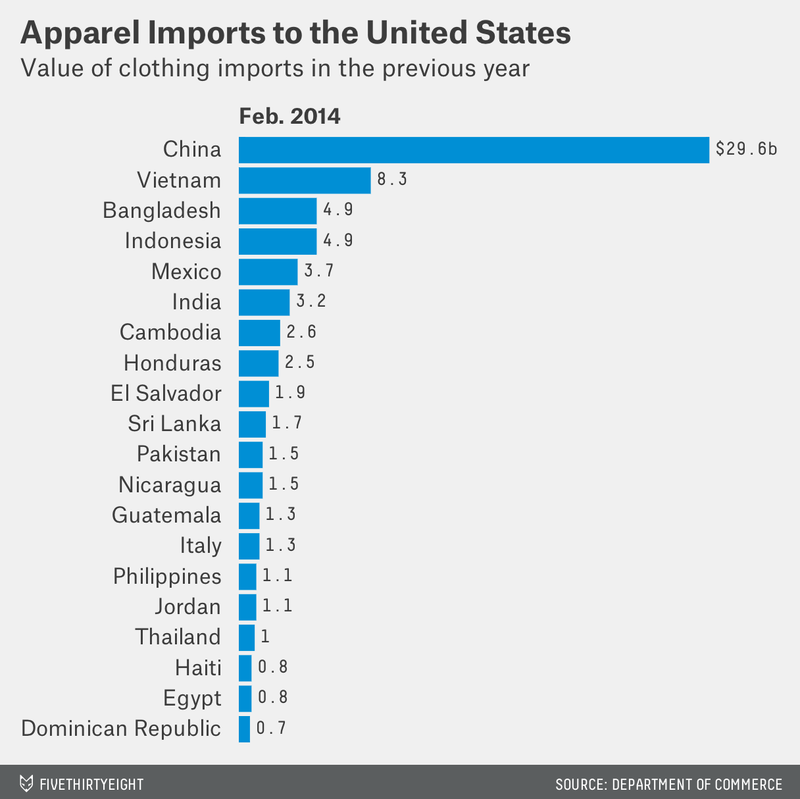 India, America’s sixth-most-important clothing importer, is next with $71. Garment-industry workers in China fare slightly better, although minimum monthly wages there vary by province, from $138 in Guangdong to $262 in Shanghai. Bangladesh has the highest share of informal employment of any country in Southeast Asia, and it’s growing. In 2005-06, 78 percent of jobs in the country were informal. By 2010, that share had grown to 87 percent. Or the World Bank, which has data on the wages of sewing-machine operators for select countries.